Begin at Ava Ranga Uka, the largest riverbed on Easter Island, where you can see several places where waterfalls form during heavy rain, before reaching the lone moai, Hanuanuamea. Beyond this moai are found Hibiscus Caves, several caverns sculpted by this former river as it carved its way through the bedrock of the mountainside, covered by the floral decorations of the hibiscus plant. Head up to the crater pond of Rano Aroi and continue onto the Terevaka summit, the highest point of the island, taking in the 360 degree panorama of one of the most isolated islands in the world. Descend from Mt Terevaka and pass by Ana Te Pahu (Banana Cave), and travel northwest to visit Ahu Te Peu, a platform with some impressive stonework, and where the largest houses were based in ancient times. 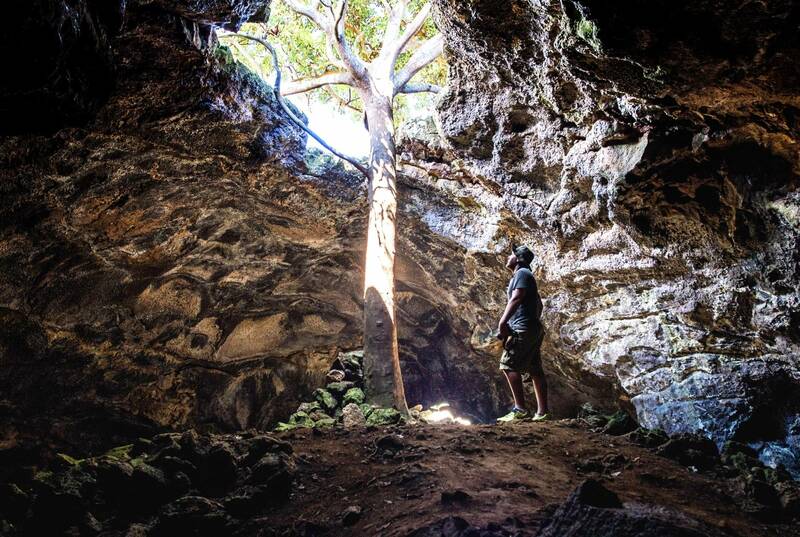 Finish the excursion by visiting the youngest part of the island on a coastal walk back to the town, passing by the caves of Ana Te Pora, Ana Kakenga (Two Windows Cave) and the lone moai at Hanga Kio'e before finishing at Tahai.